My wife gave me a Filson Original Briefcase many years ago, and it quickly became my favorite bag for its ruggedness, good looks, and their no-frills lifetime warranty. So when Filson announced a new camera bag line, I made it a case to jump on their release details. 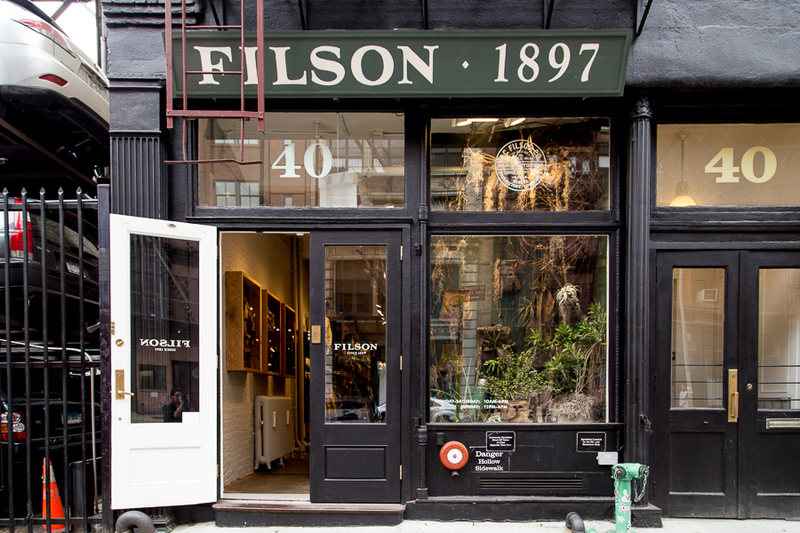 Turns out their release date coincided with the launch of their first store in New York, so I got super excited.Filson’s newest location in NoHo, NYC stands out not only as a brand with a 117 year heritage, but also as the only standalone Filson store on the East Coast. 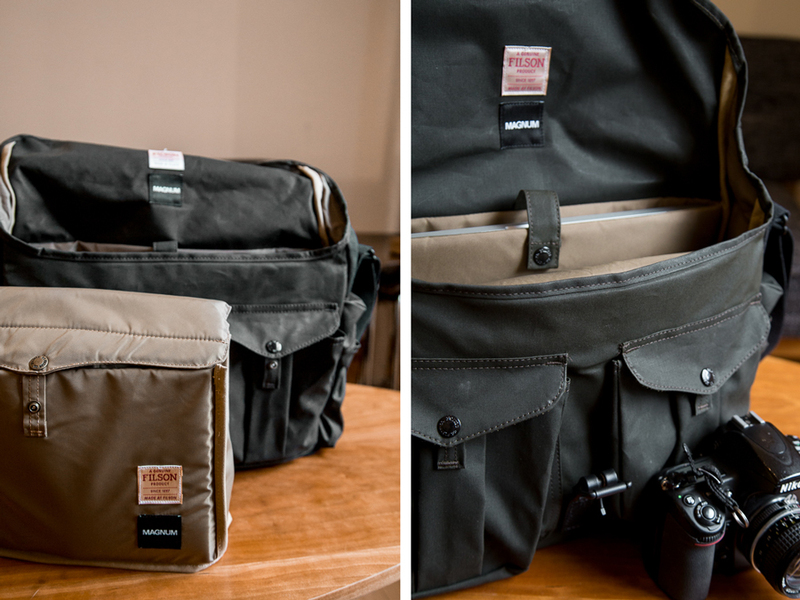 This is the only Filson location to carry the brand's new camera bag collaboration with Magnum Photo Agency, designed with the field experience of esteemed Magnum photographers Steve McCurry and David Alan Harvey. At the time of this review, Filson NYC was only 8 days old. Walking into the store, I found a friendly atmosphere despite the overtly cool industrial feel of the store, complete with a lounge in the rear with distressed leather couches, a shuffleboard table, a photo feature wall by Magnum photographers, and a "living wall" designed by Satoshi Kawamoto, a.k.a. Greenfingers. 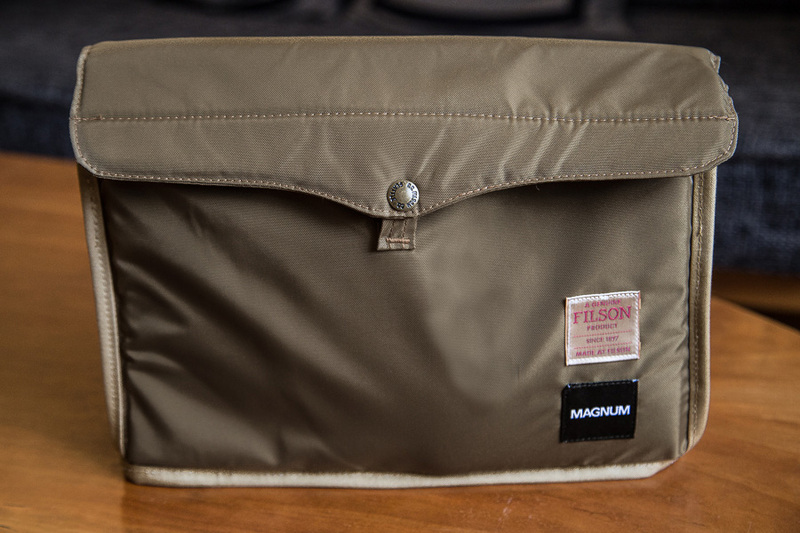 At the center of all the goodness was what I was here to see - the Filson x Magnum collection. 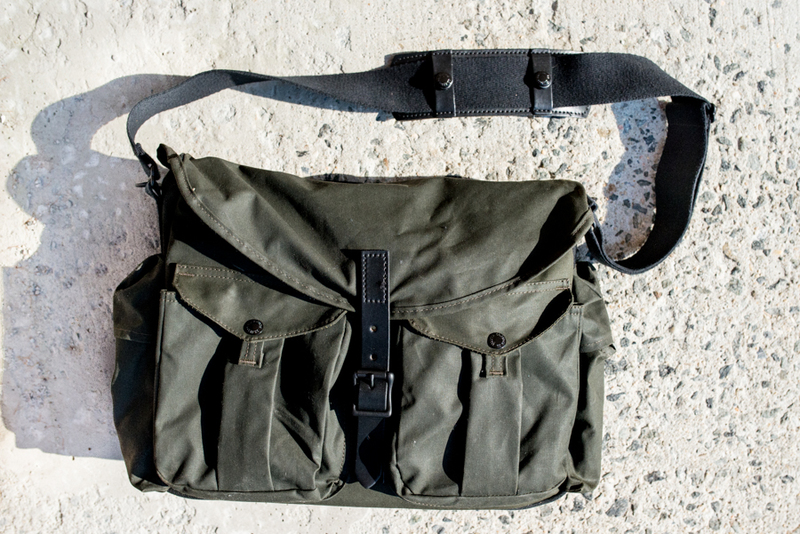 According to Chris Hunt, a store associate, the Harvey Messenger bag was the most popular product in the 4-piece series, and I managed to grab one of the last inaugural pieces in stock. My initial impression was very positive. The weather-resistant waxed fabric is much lighter than most Filson-brand cotton. Compared to my Original Briefcase which is 3.6lbs (and quite small inside), the Harvey Messenger is only 2.65 lbs, an obvious nod to lightweightness on the field. Despite being a full 1 lb lighter than its cousin, construction is quite good all around, with reinforced stitching on stress points such as where the strap meets the body. The color (green is the only option) is quite nice and shifts in different light, from an almost-gray in daylight to drab-green in tungsten light (as seen above). As with most waxed canvases, the product will exhibit signs of surface wear, which will add to the beautiful patina of the fabric over time. The back side features a mesh compartment with inset compartments for pens and what-not, and what appears to be a buttoned pocket for a phone or a notepad. I found the button unnecessary as it may snag on clothing or belts, but the mesh compartment is nice and different, since I always seem to stuff things down outside pockets in a rush and forget they're there. The mesh keeps those rampant items visible so I can clean it out every day. The side pockets are sized just right to hold a water bottle, and it is nice that they're without buttons for no-frills access. 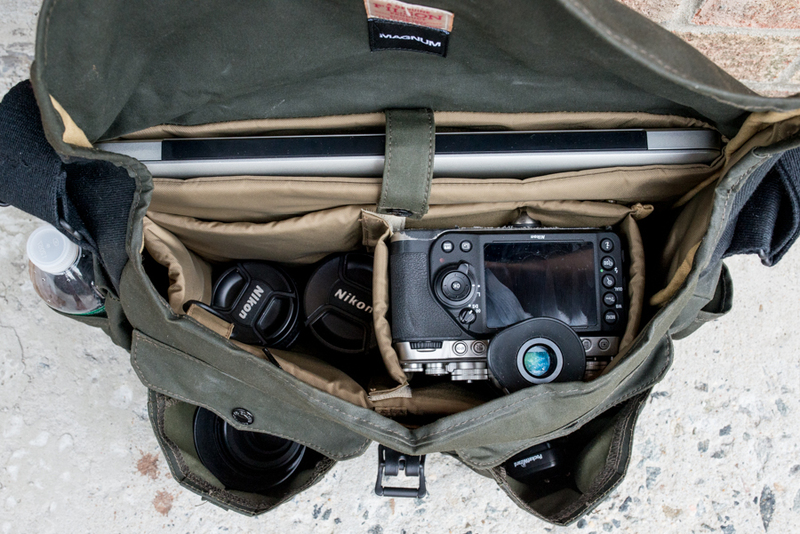 The front-side pair of cargo pockets hold a good amount, and I can even put a 50mm prime lens in there. They are sturdy enough to not collapse. Aside from the main leather buckle strap, the entire bag is made to be accessed with one hand, with low-resistance metal snaps mounted on nifty finger loops for easy operation. The clean design of the bag is welcomed, with straightforward interior pockets that don't have weird hiding places for small memory cards that tend to disappear in crevices. This happened in a tiny pocket in my Think Tank Retrospective bag and a 32gb card I was hunting down for weeks! The Harvey Messenger holds a good amount but I wish it would be slightly thicker in interior dimension. Currently, I can hold a 15" Macbook Pro, one pro camera body, a medium zoom and 3 primes, with room for a water bottle and some accessories. The dimensions are similar to the popular ONA Union Street, but with better pockets. The interior padding is removable (and very attractive) and comes with its own detachable flap, should you want to remove and use the bag for more general use. After field testing the bag fully-loaded during a 2-hour shoot , my shoulder felt pretty good. However, because the bag lacks a strong skeleton (to compromise for weight), I had to take out my camera and lenses to be able to pull out my laptop. If you have a smaller laptop, this should be the perfect size for you with room to give. I would have liked another layer of padding on the backside of the laptop compartment to give the bag some structure and cushion the hard jolts of my laptop on my backside. Another note, the Messenger (along with the Tote) are the smaller bags in the lineup and you shouldn't be overloading them anyway. I loved how lightweight the whole piece felt. Overall, this is a great choice to replace your everyday bag, with the option to use it as a full-fledged assignment messenger on the field. It is slim and attractive without being overstated, and the option to strap it across your body or tote-carry with the short strap is a nice option. I was stuck in a light drizzle at a wedding last weekend with this on, and the water repellency and oversized storm flaps give a sense of peace. I give Filson two thumbs up for their first foray into professional photography gear. I'll be using this for a long time. 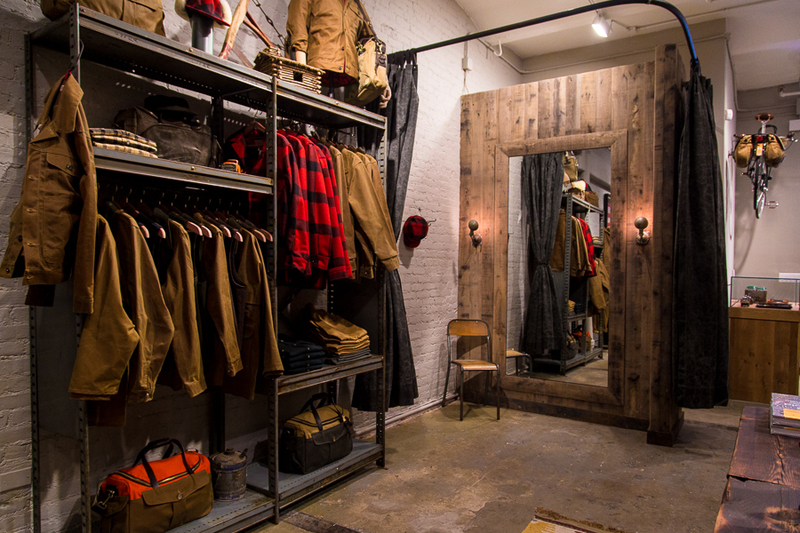 More photos of Filson NYC below.